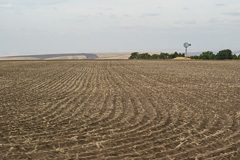 Here is a photo essay of my ham radio expedition to Garfield County. 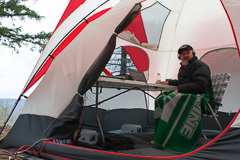 The Washington State QSO Party (aka “Salmon Run”) is a two-day event with the goal of hams making contact to as many people as possible in Washington state. There is a big bonus for talking to as many counties in the state as possible. So I made this solo expedition to the least populated and most rare county in our state. 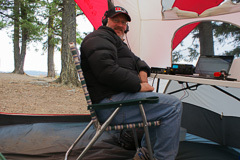 I was WA7KVC (now K7BWH) and new to ham radio contesting, having done almost no operating in the last thirty years. I hope that operating from a rare county will help make up for my lack of experience, and I'm looking forward to a little adventure. As it turned out, just driving from Seattle to this remote corner of the state was an adventure. 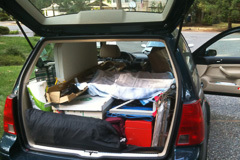 (1) Before: Packed and loaded for a one-man expedition to Pomeroy and Umatilla National Forest. I'll be the talk of the county! 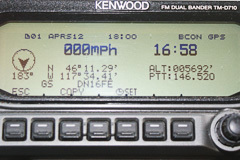 (Mostly on 3.9 and 7.2 MHz) — at Sammamish, WA. 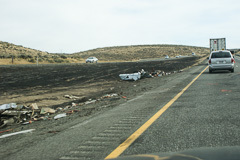 (2) Road crews are still cleaning up after a deadly multi-car crash on I-90 east of Ellensburg yesterday on 2011-09-15. There is not very much left of this vehicle, whatever it was. 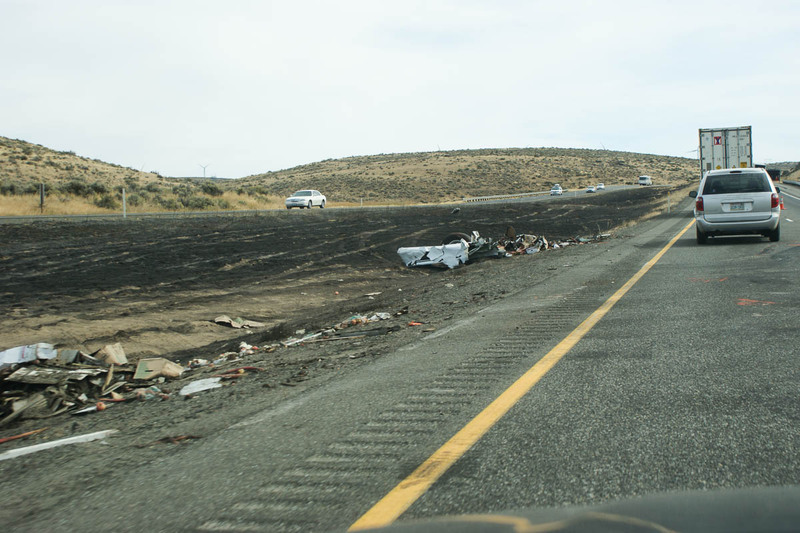 A brush fire had been billowing black smoke across the road and some vehicles slowed down and some didn't. A semi-tractor trailer was involved. Very sad. 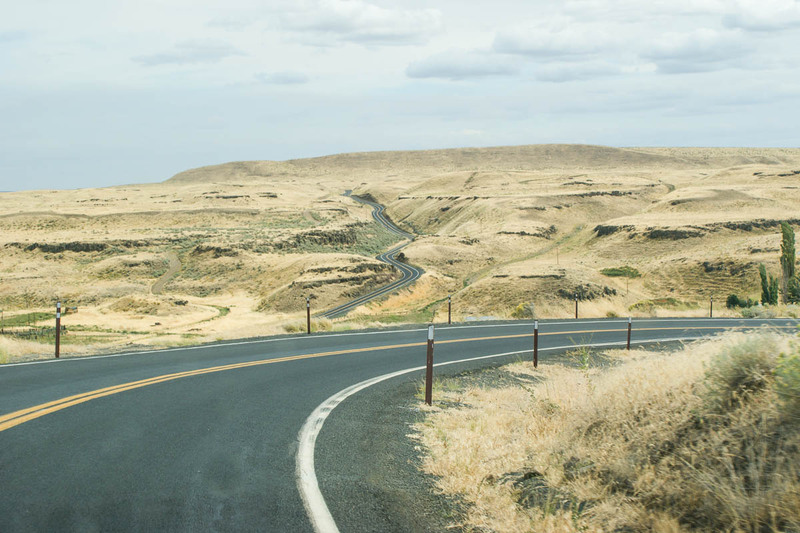 — east of Ellensburg, WA. 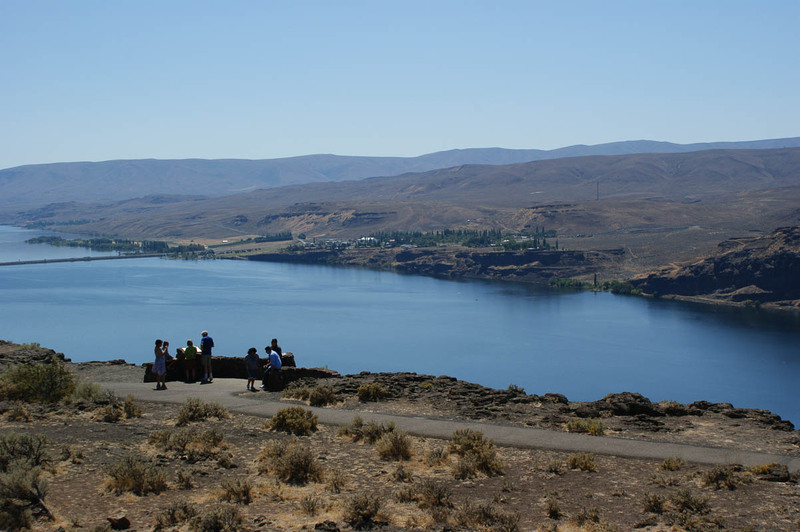 (3) Continuing eastward, you gradually climb a long hill on I-90 up over Rye Grass then coast down a ten-mile grade to cross the mighty Columbia River at the city of Vantage. 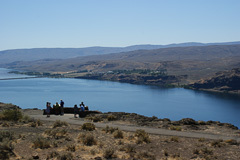 Here you see the backwaters from Wanapum Dam just off the picture to the left. This is a wonderful recreation area for boaters of all kinds, since the deep waters extend many miles off to the right. (4) Turning south after crossing the mighty Columbia from r-to-l in the photo above, you drive through the skirts of Beverly (whoopee!) 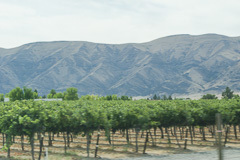 and Mattawa, then you'll see fabulous grape and apple orchards. This is an incongruous land of lush green bordered by parched desert, but it's highly productive farmland if you can just get water on it. — at Mattawa, WA. (5) Such a cute little Sheriff's office and outhouse! 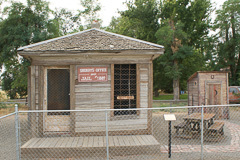 Sign says “Outhouse: Deluxe model, 2 holer seater and used well during the days.” Either they were close friends or people were smaller back then. — at Washtucna, WA. 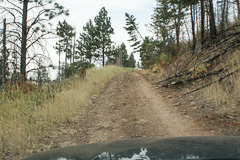 (6) Here is a really fun part of the six-hour drive across the state from Seattle to Umatilla Nat Forest. Take it from me: a turbo-charged power wagon is highly recommended. 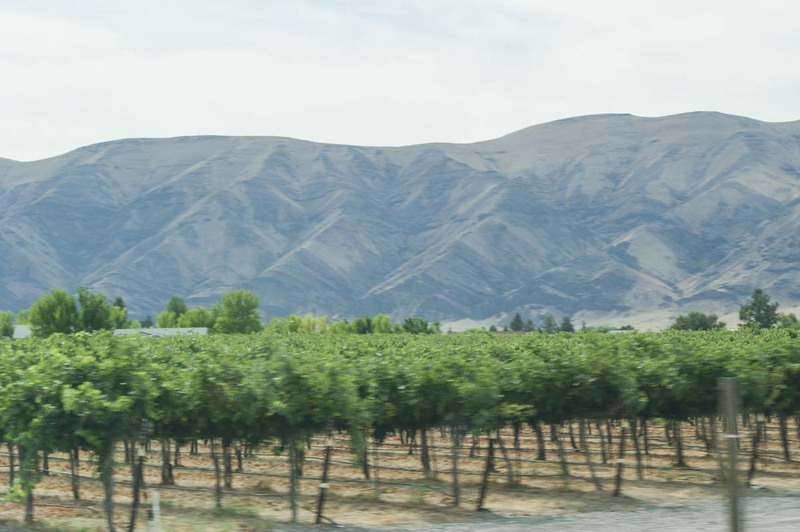 The scenic sinuous roads south of Washtucna are super! (Yes these two roads are just one.) 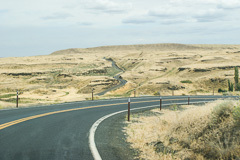 — Hwy 261 south of Washtucna, WA. (7) Welcome to the friendly city of Pomeroy! It'd better be friendly … it's the only city in the county. 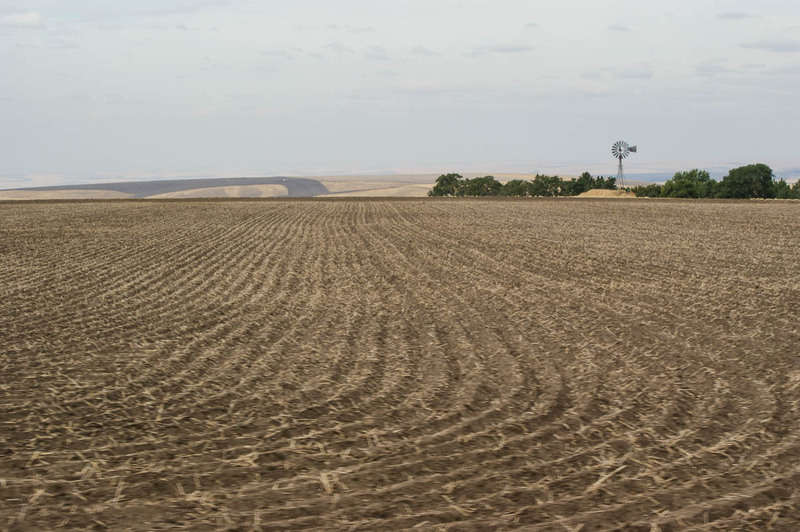 Garfield County has total population 2,260 in 546 square miles, or an average density of 4 people/mile2. But actually much less, since half the county population is in Pomeroy. — at Pomeroy, WA. I thought that Washtucna and Pomeroy were very comparable, but I just looked it up and it's not even close. 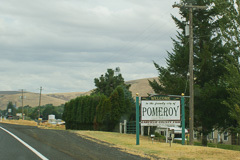 According to 2010 census, Pomeroy has 1,425 and Washtucna 208 people. (8) Vending machine in the men's room at the one-and-only Pomeroy filling station. The descriptions are so over-the-top they make it sound like you don't need anyone else. Oh right, this is Pomeroy, the only town in the #1 most unpopulated county in the state. (10) This is a very bad sign. I should not have turned onto this road. The road went downhill quickly from here. 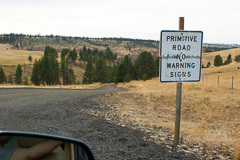 Seriously, don't ever trust your GPS enough to drive past one of these signs. — south of Pomeroy, WA. 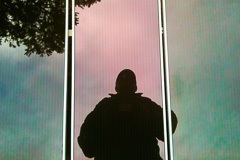 (12) Upon arrival at my campsite, where exactly was I? This tells you everything there is to know. 🙂 — at Teal Camp in Umatilla National Forest. (13) Once you arrive at Teal Camp, this bare exposed spit of land juts out into an immense valley below with a vast dropoff on three sides. It's actually perfectly safe but it's not a good place if you're afraid of heights. 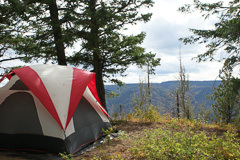 (14) Teal Camp is almost at 6,000′ on a big bluff overlooking a tremendous valley. Reminded me of the Grand Canyon only with trees. 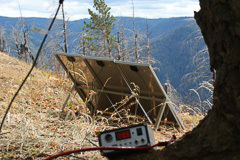 By sundown the first day I got my dipole up in the trees and the shack assembled. 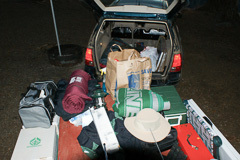 All the radio stuff goes in the tent and I sleep in the car. 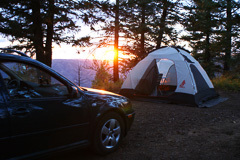 — Teal Camp at Umatilla National Forest. 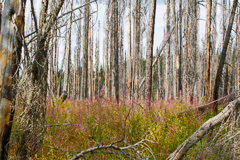 (15) The view behind my tent shows undergrowth recovering after a big forest fire swept through the area a few years ago. — at Umatilla National Forest. (16) The view out my shack window is this huge valley. One reason I like to go hilltopping is that, if the radio propagation is poor (it wasn't), then at least I have this fabulous scenery to enjoy. 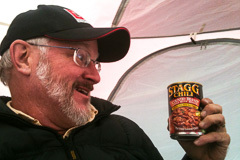 — at Teal Camp in Umatilla National Forest. (18) This is what a car looks like after you lock the keys inside with the engine running. See that window that's open almost one half inch? That's not much to work with. It would have taken a long time to get AAA on the scene, assuming I could even reach them without any cellphone service way out here. Before today, I thought it was impossible to lock your keys in a Jetta. The car outsmarts the driver at every turn. I own two Jettas and found the driver MUST use the key fob button to lock the car. And then, in the most primitive wilderness area possible, I discovered the passenger side can lock everything and close the door. Imagine my surprise. Back in the Jurrassic age it was easy, I'd just park my wheel by a bear cave for instant security. Nowadays I have to out-think this car in order to lock it at all; the Jettas are so determined to keep the driver from locking the keys inside that it frequently remains unlocked. Today's Thievery Tip: Try the Jettas first! I was awfully worried, even though one always has many methods to get into a locked car. But some methods are more expensive than others. I picked a method involving manipulating a rather thin twig to push the “window down” button. Whew! — at Umatilla National Forest. (19) My 100-watt radio covered most of the United States in this two-day contest. 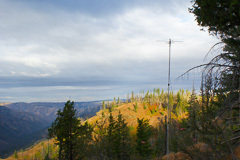 The goal of the Washington State QSO Party is for everyone to contact all 39 counties in our state. I made this expedition to Garfield County so I'd be in the #1 least populated and most rare county. It worked — I was in big demand on the air. 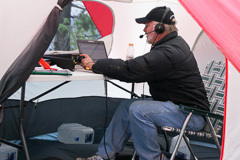 — at Umatilla National The whole basis of my strategy was depending on having a rare county make up for my inexperience: First HF contest, first Salmon Run, first time using N1MM logging, first CW contact in 30- years, first HF expedition, first battery portable, first solar panel, first visit to Umatilla Nat Forest, first solo camping trip, first time I locked my keys in this car with the engine running. (20) A look just off the edge of the bluff I was camping on. Awesome. My 102-foot dipole antenna (a model known as G5RV named after its inventor) has one end attached to the top of the big dead snag on the right. 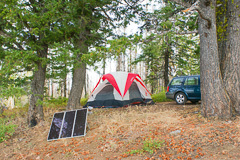 — Teal Camp at Umatilla National Forest. (21) What's it like? Cold. The air was cold and windy all the time, and valley air whips over the bluff constantly. But on the air, it was warm and friendly. 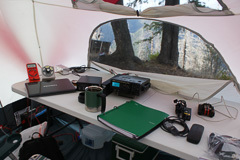 Everyone was polite and efficient and even helpful on 3.5 MHz and 7 MHz bands. The longer-distance band of 14 MHz was a brutal verbal fist-fight of no-holds barred transmitter competition. I stayed away from 14 MHz even though I could have gotten more multipliers by working more states and countries. (22) Don't tell my wife that I had a Stag Party! Then again, it was not a very hot party. In fact, it was not a hot weekend at any moment — my propane burner didn't work. No hot coffee, no hot meals all weekend. Yeah really. But ya just make the best if what you've got. It would take hours to drive anywhere and back. The problem was my fault — I bought new little propane bottles but the fittings didn't match my camping burner. I was well prepared and brought two of almost everything. I even had two little propane bottles. Of course they both didn't fit, lol. It's a time-management problem. The whole trip is designed around being on the air for 23 hours in the weekend. There are lots of things I could do if I was willing to trade radio time for them. Not worth it, to me. (23) Imagine free energy falling from the sky all day long! This 45-watt solar panel array kept a big 12v storage battery charged for all my operating needs. It's a wonderfully silent system — too bad someone was playing their “radio” so loudly all day long. — at Umatilla National Forest. (24) The laptop runs N1MM contest logging software (my first time). It's great! I only enter a callsign and their 3-letter county. Very efficient. However, I had trouble keeping the laptop battery charged. 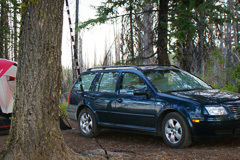 A full charge takes three hours, it has to be plugged into a DC inverter in the car, and I can't operate while it's charging because it generates lots of radio noise. Bummer. Next year I'd like to have two laptop batteries and swap them from time to time. I also had a lot of trouble with radio noise emitted from the USB cable between laptop and radio. The radio would chirp and squeal in sync with the polling interval, twice a second. So I manually entered frequency and mode whenever I changed bands or turned knobs. Next year I must find a “radio quiet” link. I think it is just a matter of routing the interconnecting cable to stay away from the radio. 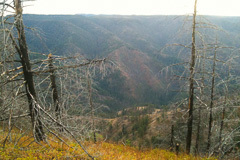 — at Umatilla National Forest. (25) The solar panels can easily keep the storage battery topped off in bright sun, even while transmitting in the contest at full bore. Too bad it was overcast most of the time, but it would still charge through the clouds. — at Umatilla National Forest. 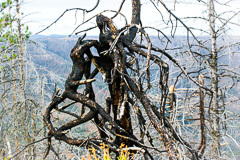 (26) Tortured trees bear witness to a forest fire a few years ago. I think this one melted. — at Umatilla National Forest. (27) Captain Solar, Commander of the Airwaves! (28) This 144 Mhz beam on a 20′ mast pointed north-east gave me another band that reached Seattle and also Sunnyside OR. So … what did YOU do at sunrise last Sunday? 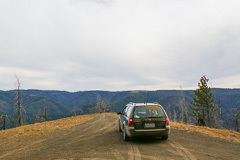 — at Umatilla National Forest. (29) After: Contest is all done, time to break camp and skedaddle. Say what? All this stuff needs to fit into there? Oh no. But it was finally loaded successfully by flashlight. And then it was time for a six-hour drive home in the dark. I arrived home safely and got to bed at 3am and instantly fell asleep for twelve hours. Yes, this trip was an adventure. Gas: 26 cents per QSO. Activating a rare county: Priceless. This years overall results will not be tabulated for everyone until late October 2011. However, 86,000 points is a very good score by any measure! 1st of all operators in Garfield county!